The federal government’s official poverty figures for 2017, the first year of the Trump administration, were released Wednesday, showing an improvement over those of its predecessor. But other data, released the day before, were even more heartening. The Census Bureau’s official statistics indicate that 12.3 percent of the population and 17.5 percent of children live in families that earn less than the official poverty threshold, or about $25,000 for a family of four. Those figures are significantly better than any of the eight years of the Obama administration, but remain unexceptional by longer-term historical standards. However, a more important dataset was released Tuesday, when the Bureau of Labor Statistics quietly posted its Consumer Expenditure Survey microdata. 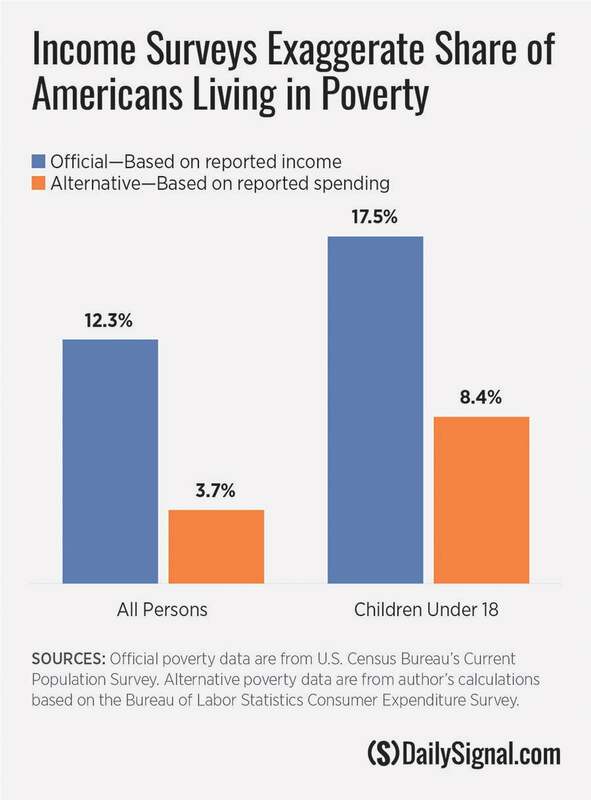 With that dataset, I’ve calculated that only 3.7 percent of the population live in families that reported spending less than the federal government’s official poverty threshold last year. That’s less than a third of the 12.3 percent who are officially considered to be poor, and within 0.5 percent of the record low. Similarly, 8.4 percent of children live in families who spend less than the poverty threshold, less than half of the 17.5 percent who are officially considered to be poor, establishing a new, all-time record low for child poverty. Why are the official poverty figures so much higher than these alternative figures that I’ve calculated? The Census Bureau considers only the “money income” each family reports in an annual survey. These official “money income” figures omit roughly 95 percent of the $1.1 trillion U.S. taxpayers provide in means-tested cash, food, housing, and medical benefits for low-income people each year. It also excludes substantial off-the-books earnings of low-income households. Yet, when asked about their spending, these households are likely to disclose many of the purchases that their welfare benefits and off-the-books earnings enable. They typically have air conditioning, computers, DVD players, and cellphones. They rarely report material hardships, such as hunger, eviction, or having utilities cut off. Their spending, not their income, better represents their true living conditions. There’s much good news for the American people in the official poverty figures released Wednesday. But the Trump administration should do more than just tout these figures. It should reconsider the federal government’s official definition of poverty and work to establish an expenditure-based poverty metric. Then it will become apparent that living conditions in America are not merely good, but rather great again.